to complete exterior projects on our houses. provide the atmosphere to tackle those projects. the right color to paint your front door this summer? 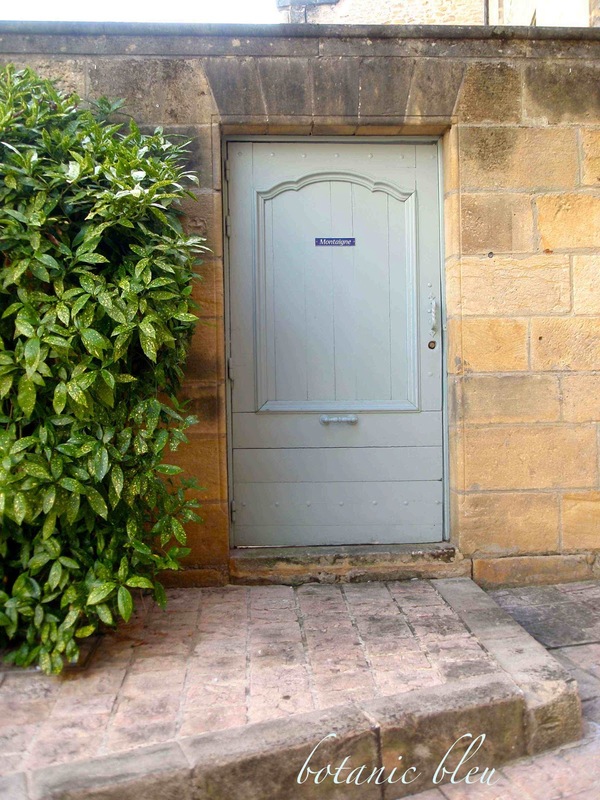 Where did I find inspiration for my front door? only a shortage of time in which to linger. with leaf scrolls around them. #61 doors are in Paris, also. These look plain after seeing #21 above. makes us lose sight of the beauty of these. We lose sight of our own good qualities. 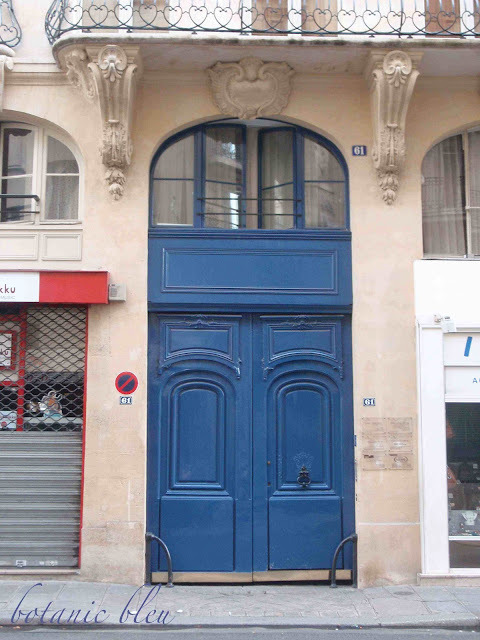 Who lives(d) at this Paris address? The monogram above the door hints at a double D.
in Sarlat, France is enhanced by the deep blue of the doors. 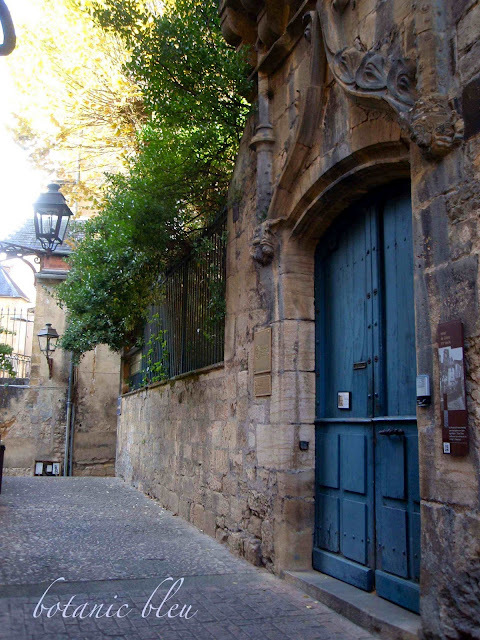 More views of these doors are at Real French Doors In Sarlat. with a curved raised panel and cut stone header. in its truest sense of the phrase. The paint could be an Annie Sloan Chalkpaint! as we gaze at the doors. Then we take in all their beauty, too. 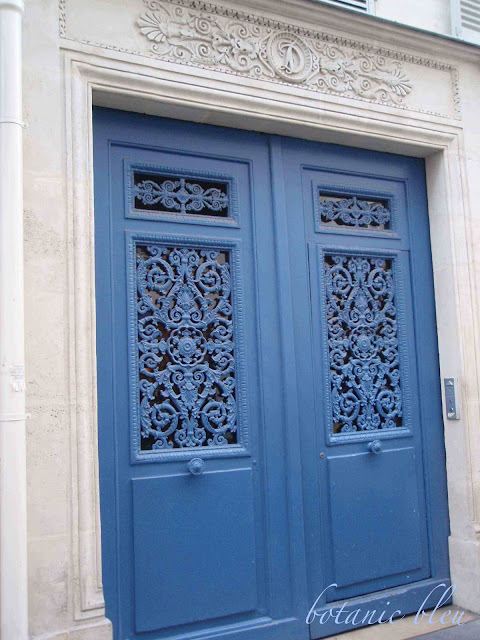 and the ogee-edged panels remind us of French royalty carved doors. down a narrow pea-gravel walkway is inviting in its vibrant blue. it's in the same small Dordogne town. customers with its cheery blue. Welcome to my blue front door. Gorgeous! Unfortunately, our HOA only allows certain colors and blue is not on the list. Sad, I know! 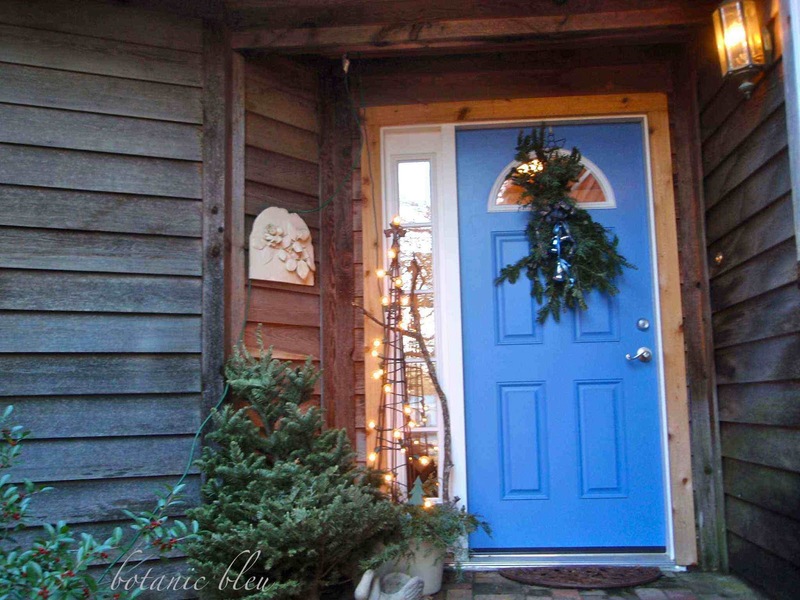 Love your blue door! My favorite door, other than yours, is Sarlat. That pale blue has a long-ago quality to it that is very compelling. What an amazing post; thoroughly enjoyed it. Oh, what a blue-tiful post! I love them all! Thanks for sharing. Such a beautiful post! It reminds me of my time in Paris ~ Swoon! I loved all the beautiful architecture and the doors, especially. Also, they love to paint the shutters blue! Thank you for sharing your lovely photos. I'm visiting today from Dwellings. I co-host a Linky Party Tuesday (open thru Sat) and I'd love for you to link up! I hope you get a chance to stop by, link up and leave a comment, too! If you could not find a door to your liking out these, there would be a problem. What a cheerful entry your blue door makes. 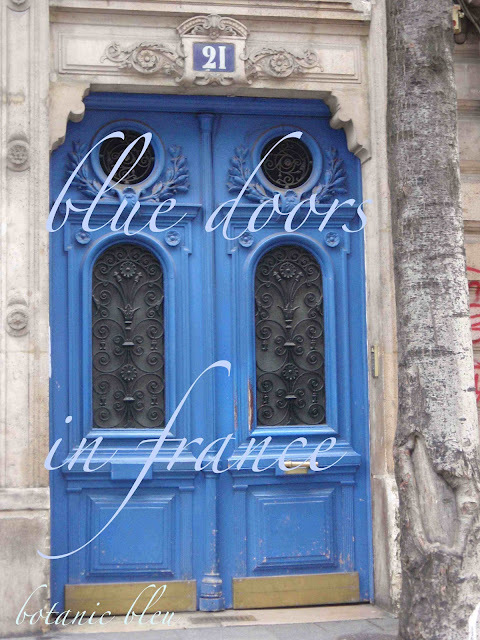 Thank you for sharing the blue doors of Paris. They were wonderful. Very nice! I love that blue color. I have a picture of a pair of doors in Greece that are that kind of blue too. Mine was bought not actually seen in person! How lucky you are to have been in France to see them yourself! 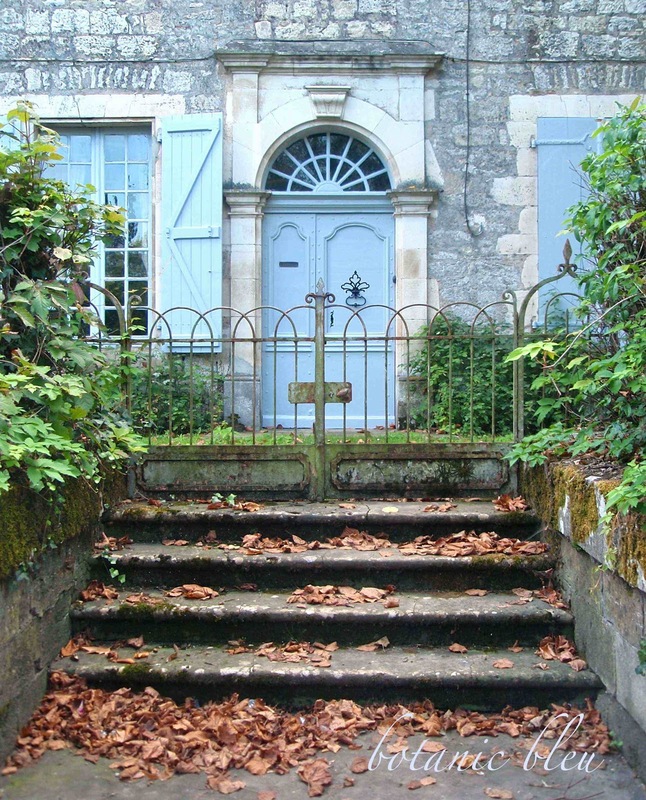 Your lovely array of French blue doors is charming! Don't they all look like paintings, too pretty to be real, but belonging in fairy tales? I'm trying to decide which one I like best and having a difficult time! 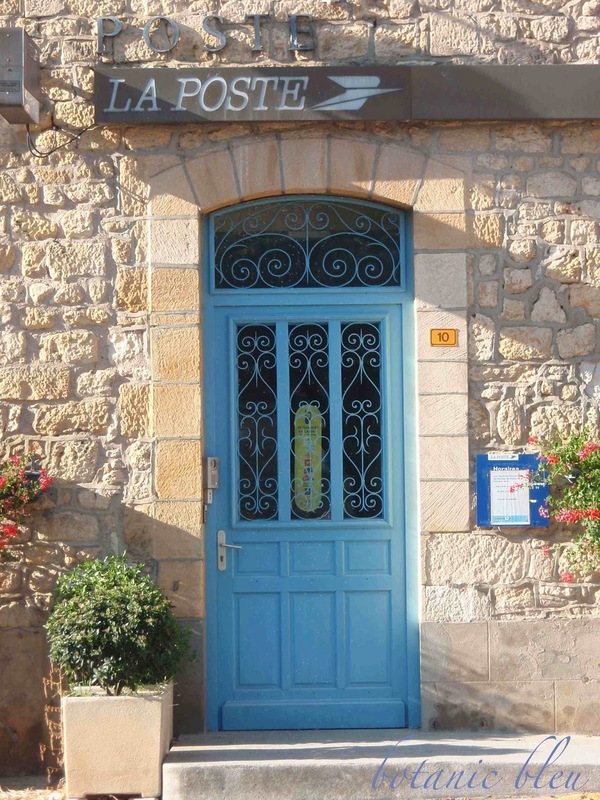 There's something truly enchanting about the Gothic one in Dordogne; a sense of history, a quiet hideaway after the gravel, but also the post office one is adorable and I can't resist the juxtaposition of delicate red flowers on rough, gritty stone! Your own cheery blue door is a pleasant surprise among the warm, woody exterior. Enjoyed this presentation! Oh your new door color is a brilliant blue! !It is gorgeous. OMG - so beautiful. 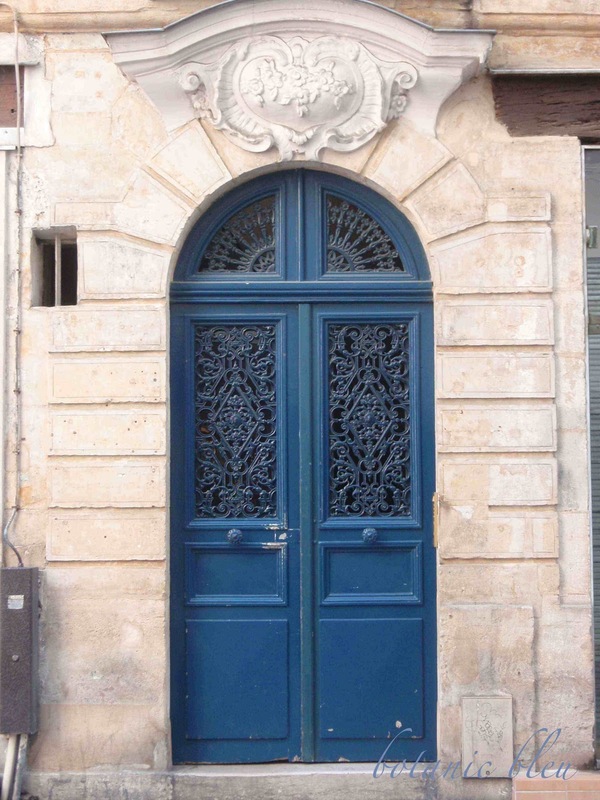 I love interesting doors and France definitely has its share. Love your new blue door too. Ours is red. 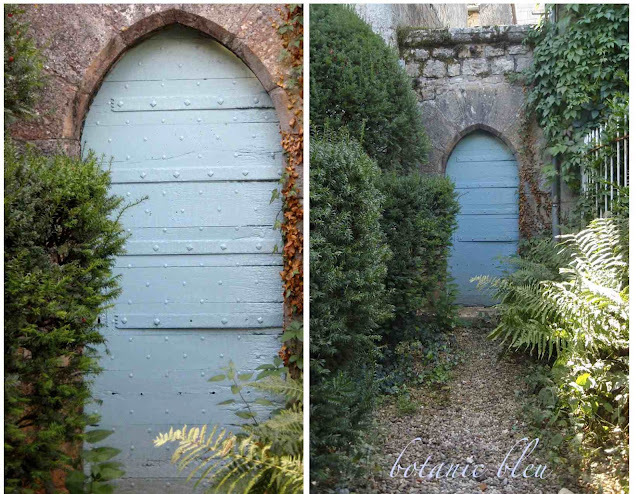 I love your inspiration pictures and the shade of blue you chose for your door is lovely. Isn't is something how the front doors to a home just make the house! I notice that so often as I ride through neighborhoods...the front doors make all the difference! GORGEOUS inspiration here...love that color of blue...looks soooo pretty! I used to have my kitchen this French blue color! Thank you for joining Home Sweet Home! 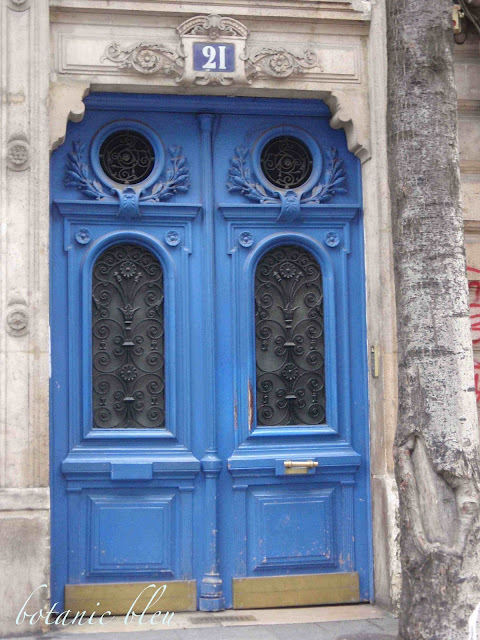 What a wonderful collection of blue doors! Mine is pink but you sure have me thinking about the blue. I host a weekly link party called "Oh, the PLACES I've been!" and it would be wonderful to have you link this post. The link goes up at 7 pm on Sunday nights. Blue doors are always heartwarming! Of all the colors, blue is the most soothing and relaxing to the eyes. It has a certain charm that captures attention more than any other color. France is a home to intricate and awesome design and structures, so blue doors are perfect there! 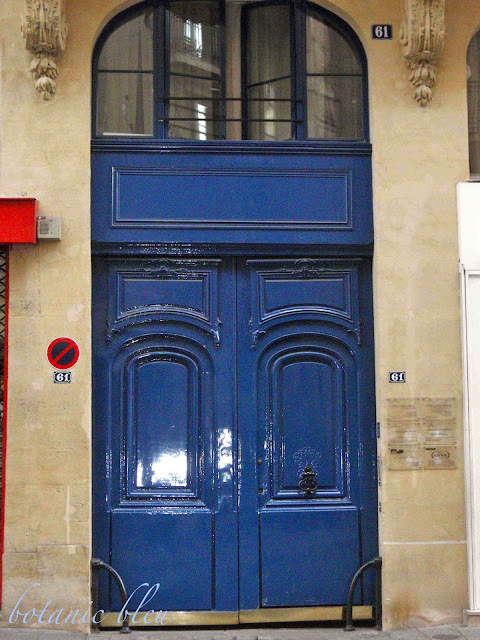 Those are captivating blue doors! France is, indeed, a very inspiring place in all aspects. 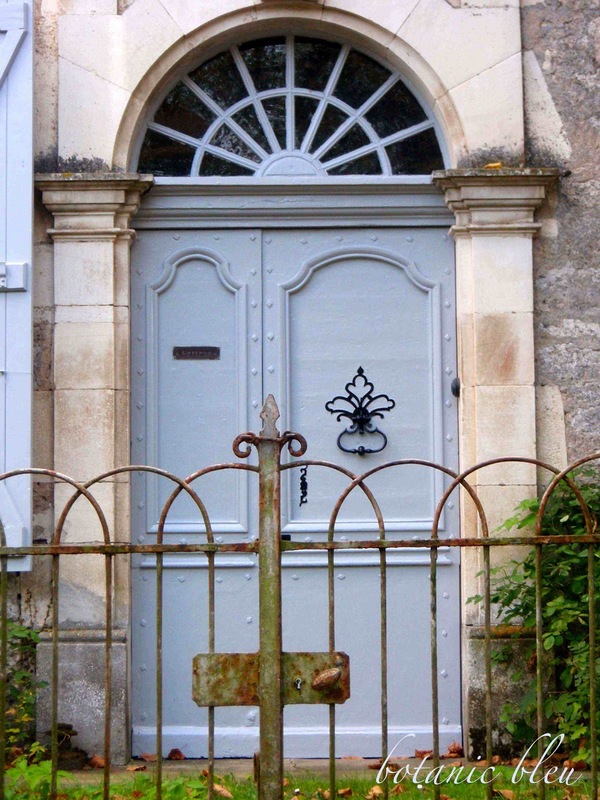 Aside from color, its delicate and intricate door designs make every house distinct from one another.